Thank you to all who participated in our latest stair design photo of the month competition. For the second month in a row, the winning staircase comes from the state of Virginia. 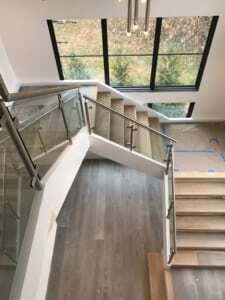 This breathtaking project is a modern open riser staircase designed and constructed for a residence in McLean, Virginia. This project was a collaborative effort between our DC and national team. First, the staircase was sold by Michael Brown and Ken Hoffman out of the DC office. 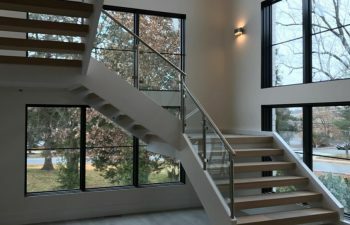 Then, Scott Kittle began designing the one of a kind staircase, working with the homeowner and other critical team members to design the open riser staircase. Then, the open riser stairs were built by the Charlotte manufacturing team. 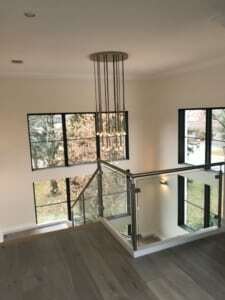 To finish, the stairs were installed by Jose Diaz, Autoro Navarrete, and the local DC team, and the railings were installed by Vitor Estanqueiro. This incredible freestanding staircase utilizes classic open riser wooden treads, coupled with a stainless steel and glass railing, to complete the modern look. Modern style staircases have becomingly increasingly more popular over the years, and it is easy to see why they have become such a sought-after look when looking at this beautiful project. Open riser stairs have grown in popularity in recent years, offering unobstructed views throughout the home and a beautiful weightless appearance. Our skilled team is experienced in designing and constructing open riser staircases, and our turn-key installation process leads to flawless execution in each project. Our company has extensive capabilities to provide outstanding open riser stairs with accompanying handrail systems. As the single source of responsibility for the complete staircase system, we are committed to customer satisfaction, and we are proud to provide a seamless, cohesive design with flawless fit and finish. Visit our open riser staircase and modern railing design gallery for additional product photos and details.